The Penn DSW curriculum is designed to engage students in high-level learning that challenges them to think methodically, critically, and creatively about social work theory, practice and pedagogy. 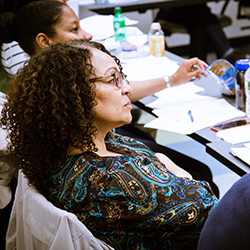 The program begins with a two-semester foundation that spans clinical theory and research and ends with a core course on trauma-informed individual and organizational interventions. Concurrent with their coursework, students engage in a dissertation workshop that helps guide them through the first stages of the dissertation project. 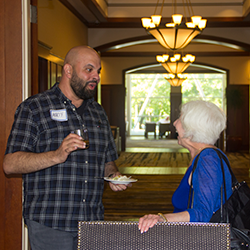 Near the end of the first year, students are matched with a dissertation chair who shepherds them through the remainder of the dissertation process. The curriculum in year 2 continues with specialized, applied courses that cover clinical content and preparation for teaching. The second and final year of coursework culminates in two electives that the student cohort selects and takes together as a group. Students continue the dissertation work, under the direction of their dissertation committee. Enlightening and intellectually stimulating … thoroughly engaging … fascinating readings. Faculty were incredible guides in our journey toward developing our clinical and academic point of view. Broadened my thinking to consider the influence of politics, culture and society on the evolution of theory and practice. Stimulating and relevant … thought-provoking … really challenged my thinking and assumptions. Opened the floodgates of theoretical and practical learning in clinical social work. Made research fun and exciting, something I didn’t think could be possible. Challenging yet thoroughly enjoyable … a great combination for learning. During the third and final year of the program, students complete, defend and deposit the dissertation. There is no formal coursework, but students participate in a dissertation seminar that provides structure and support and keeps them moving steadily toward the defense. **Note: Some students are able to complete the dissertation in as little as two years. View the course descriptions for DSW classes. In collaboration with their dissertation mentors and later with their dissertation committees, students begin developing a dissertation topic in the first semester of the DSW program.